A couple of days ago, January 28th to be exact, there were 45 visits to this very blog. That is the most visits in a single day I have had in a long time, by almost double. What the heck happened? Was it my scintillating eyewitness account of beautiful, if dry, southern California weather caused by the Ridiculously Resilient Ridge of high pressure parked over the Pacific ocean? Was it just one single person discovering my blog and deciding they just had to read the past 30 posts? I really wish I knew because I would like that to happen every day! No, really, it is OK if only six of you visit me on any given day. But face it, we all want to be loved and if 45 people show me blog love by visiting instead of, say, four, I am going to notice. Speaking of one person reading 30 blog posts, have you ever done that? Look at a new blog, get sucked in to reading lots of posts, and then, before you know it, you feel like that blogger is either 1) your new best friend, or 2) crazy as a loon? I have only done that once or twice. How about you? Is it possible that the so-called winter of 2013-2014 will be known as the “Year without winter”? We are beginning to think so around here. I know you folks in other parts of the country are reading this in disbelief, but the same weather phenomenon that is causing you to be buried in snow and ice is denying us a winter. Called the “Triple R” by weather men, the Ridiculously Resilient Ridge of high pressure has parked itself over the Pacific ocean since October, driving the weather patterns that usually bring California rain and snow at this time of year north and east. That precipitation has to go somewhere, it doesn’t just disappear. So far, we have had about two weeks of winter weather around here, way back at the beginning of December. Otherwise, it has been dry as a bone and spring like, which is nice, do not get me wrong. Weekend before last a friend’s daughter had an outdoor wedding. When I had heard that plan a year ago, I was a little worried. After all, in January it can rain, it can be windy, and/or it can be cold. But the wedding went off without a hitch weather wise and it was like a beautiful April day. Given that the bride’s name is April it was fitting. We have very warm summers in Inland So Cal. So winter and summer balance out. You get enough cold in the winter to wish it would warm up. In the summer it gets hot enough you look forward to the cold. I am beginning to wonder if I am going to get enough cold this year to be ready for summer…. But the biggest problem is that we have not gotten much rain. The governor has declared a drought and I do not look forward to trying to keep the plants in the yard alive (not the grass, who cares about the grass) if they start limiting the water that we use. The good news is that we were planning on replacing the toilets soon anyway so the new ones should save on water. I need to start mastering the five minute shower. If we don’t get some rain soon that just may be mandatory! UPDATE: The weather man says there is a possibility of rain by the end of the week. Oh let it be so! A friend of my brother posted this photo of Brother Dear on Facebook. It was taken on a camping and fishing trip up by Bishop. Shorts and flip flops. That was so my brother. And don’t you just love the camping hat? This is my new favorite photo of him! As I have mentioned before, I do quite a bit of writing on local history. I just love to dig into the research for a story. I look into the main character’s lives in census records. I dig through old newspapers looking for bits and pieces for my story. I can (and sometimes do) spend hours a day doing research. Pure bliss! When I am poking around, often the same names pop up over and over again, particularly the names of government officials, judges, and law enforcement officers. They become like old acquaintances. Sometimes their names pop up over the course of years and I can follow their career from local lawyer to judge, for example, or from city police officer to deputy police chief. One such man was John Baird. He was a constable (police officer) in the big city next door. Back then it wasn’t unusual for Baird, the city constable, to accompany a sheriff’s deputy out into the country side to investigate a crime, even though is was outside his jurisdiction, an early form of mutual aid, I suppose. Since I have done quite a bit of research on stories in my area just outside the city, I ran across Baird’s name numerous times and he became one of those old history acquaintances. I begin to feel like I know people like John Baird personally, even though they lived long ago. Then, one day, I run into a story about my historical acquaintance. Maybe they got in trouble, or maybe something bad happened, like it did to John Baird. It is such a shock! It is almost like I am being told about a person I really know, in 2014. So I am sure you are wondering what happened to John Baird. Well, he moved to this area in 1904. By 1912 he had become th deputy police chief. Good for him! Towards the end of 1912 the police chief fell il and passed away and Baird was made Acting Police Chief. On the night of December 15th, he called one of the police officers into a back room at the police station and got on him about drinking on the job. The officer pulled out his gun and shot Baird to death, right there in the police station. He was 33 years old. And that is the true hazard of history writing, folks. People do bad things. People die. And even though it happened so long ago, I still feel sad! Are you, dear readers, familiar with the brand of women’s clothing called “Alfred Dunner?” I remember when I was in my teens and 20s my mother and grandmother dearly loved Alfred Dunner clothes. My mother found an Alfred Dunner outlet where you could get suits and slacks and blouses for a steal. One year, she bought a suit and blouse for each of her five sisters, the deals were that great. Needless to say, Alfred Dunner was old lady clothing to me. Of course, now I am about the age mother was when she discovered Alfred Dunner. There must be a gene that kicks in at about the age of 50 that allows Alfred Dunner to sneak in and take root in your brain. The pretty prints and colors call to me a siren song of “buy me, buy me.” As much as I am reluctant to admit it, I own clothes by Alfred Dunner. Heck, I seek out clothes by Alfred Dunner. OK, I might as well fess up to the whole truth – I love Alfred Dunner clothes. There I said it. And now I can officially say I have become both my mother and my grandmother. If they were both alive all three of us could go out and about in our matching Alfred Dunner outfits! LOL! Take one orange tree loaded with ripe fruit. Add one night and day of ridiculously hard wind. What do you get? A self picking orange tree! Hubby picked up two plastic grocery bags full! 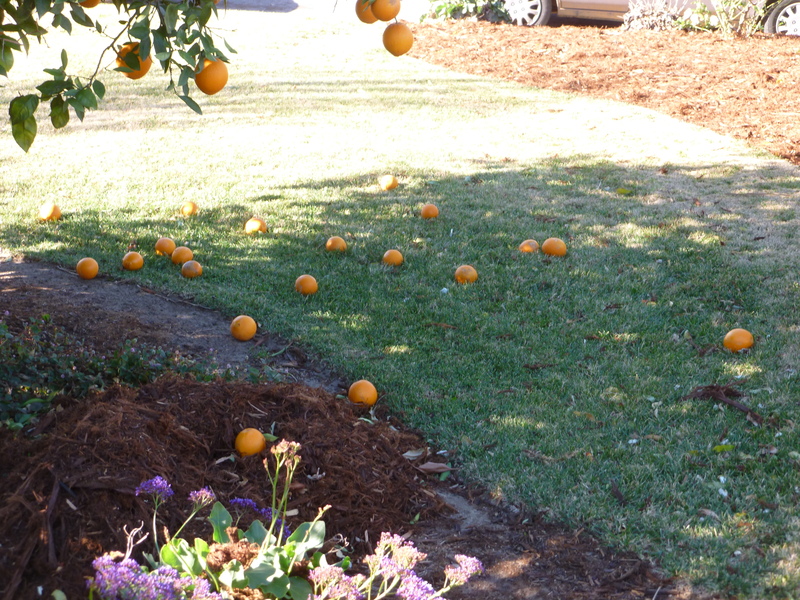 But there are still a load of oranges left on the tree. It amazing how many oranges just one Navel orange tree will produce! This past week has been crazy and amazing and exhausting and fun and sad, all rolled up into one big package. On Wednesday the 8th we had Brother Dear’s memorial service. It was really good. I said something about my brother and my girls said something about their uncle. Several of his friends got up and said something and it was really a joyous celebration of him and his life. There was lunch at my house afterwards and then we collapsed for a while. That evening we took Hubby out for his birthday. Have you ever been to Farrell’s? It is a fun place where you can get a meal and amazing ice cream desserts, perfect for a birthday. On Thursday it was all about getting the rest of the house into shape for visitors. On Friday two of hubby’s relatives from Texas came in and we visited and such. They stayed with us. We had last seen the Texas folks almost 20 years ago so it was great to reconnect. On Saturday we had the celebration of life for Mom in Law. We had 42 people at the house that day. We looked at photos, we reminisced, we ate, and we toasted her life. In addition to the folks from Texas, we also had family from Hawaii and northern California. So it was quite the family reunion. It was a very good day. On Sunday we went to church with the relatives from Hawaii, picked up the folks from Texas afterwards, and went out for Mexican food. The food at Taco Villa was excellent and everyone enjoyed the lunch, the talking and again, the stories. Uncle Jim, all 89 years of him, always wanted to see the Crystal Cathedral because he remembered when its founder was preaching at a drive in theater. So yesterday we swung by there and then went down to the beach where Cousin Kim could plant her feet in the Pacific Ocean and pick up shells. That night it was off to be with family again and eat a fantastic dinner at the home of one of our local family members. Seriously, they barbecued like there was no tomorrow and we all enjoyed it. Today the Texas folk are headed back home and tomorrow the Hawaii folks do the same. Then Hubby and I collapse and reminisce about the love and support we received from our family. It was all good. I never thought my brother and I were much alike. He had dark hair, I was a blond. He was on the shorter, stocky side. I was on the taller side (for a woman) and had a thinner build, at least back when we were growing up! He inherited the freckled face of our redheaded mother. I didn’t. We took different paths as adults, one going to college, one not. He was a “good old boy,” but I don’t think I am a “good old girl.” But he was still my brother and I loved him and he loved me back, however little we seemed to have in common. Yesterday we held his memorial service. A number of his friends got up and shared the positive impacts he had had on their lives. One thing they all said was that Mikey, or Angry Mike, or Magic Mike (he had lots of nicknames) always shared the honest truth, however unpleasant that was. Mike didn’t pull any punches, they said. And it was hearing that that I realized that my brother and I were more alike than I ever realized. Because I have that same personality trait. I tend to tell it like it is. Some people do not like that. They say it is bad, as in “You are always so negative.” I don’t look at it that way and apparently neither did my brother. Hearing about Brother Dear from his friends was really a gift yesterday. Finding that connection with him was beyond a gift. The truth my brother spoke about tended to be about people’s recovery from addiction, something he knew a lot about after becoming sober himself 10 years ago. I tend to talk about issues in my community, particularly things that aren’t going well or aren’t being dealt with. I don’t believe in using truth as a cover to hurt people. But Brother Dear and I both figured out, all on our own, that hiding from the truth doesn’t make things better. Hearing what an impact he had on other people’s lives just strengthened my resolve to go forward and point out the truth, however others may see it. My brother knew that was important and so do I. A funny thing happened on the way to lunch…. We met friends for lunch on Sunday, finally seeing them for our annual Christmas get together. What can I say, life has ben busy and crazy for both families, although not for the same reasons. We got there a few minutes before they did and sat on a bench in front of the restaurant to enjoy the nice weather. Parked right in front of the restaurant was a car with a white poodle inside. It had the classic fluffy poodle hair cut. I don’t think that poodle was very happy about its situation as it was bouncing all over the inside of that car. As the most active thing happening around me I just watched the poodle. It bounced into the front seat of the car, put its paws on the dashboard, and leaned in really close to the windshield. The windshield was angled and the little dog leaned in as far as it could. As it pressed its nose as far forward as possible, the fluffy white hair on its head came in contact with the windshield and, suddenly, the top of its head was flat as a pancake and the fluffy white hair went from being 3 or 4 inches tall to about 1 inch tall! It was the silliest thing I had seen in a long time! Of course the rest of the family heard me laugh and looked at me with a question in their eyes. I waved my hand towards the dog and managed to say “poodle” as I laughed. They looked over and saw the flat-headed poodle and they started laughing, too. I was glad it wasn’t just me that found the silly dog funny! I wish I had a photo to show you but, alas, I didn’t have my camera with me. Like I said before, you have to find the joy where you can, folks! Thank you, dear readers, for all the reading and comments you did in 2013. This past year was not the best one my family has ever had and I appreciate the chance to vent some of my stories on this here blog and the kind comments that many of you have made. I just need to make it through the next two weeks, one memorial service and one celebration of life, clean out one apartment and start back on cleaning out a 50 + year accumulation in a house….all with Hubby and the girls, of course. I may or may not be commenting on all of that in the weeks to come. I hope you will understand if you see a light or funny post in the coming weeks it isn’t because I am making light of the very heavy things going on in our lives. It is because I was taught by my parents example that you have to pick yourself up and get on with life and that is what I will be trying to do. I am so glad all of you will be along as I do my best to do that. I wish you a wonderful new year in 2014. I look forward (with a healthy dose of trepidation) to seeing what it will bring!